In September, the Volvo Concept Coupé was launched to critical acclaim and many awards, and represented the world’s first insight into Volvo Car Group's (Volvo Cars) new design direction under Senior Vice President of Design, Thomas Ingenlath. 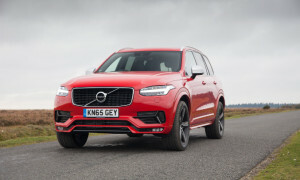 It also showed one interpretation of how the proportions and versatility of Volvo Cars' new Scalable Product Architecture, that will underpin all medium and large cars in the company’s future, could look. The Concept Coupé was the first of three design studies. The next chapter in Volvo Cars' new design story showcases how the company’s famous safety technology as well as a contemporary Scandinavian active lifestyle could be integrated into the new architecture. The Volvo Concept XC Coupé will make its world debut at the North American International Auto Show (NAIAS) on January 13, but full details including press release, videos and images will be published on January 8. The Concept XC Coupé builds on Volvo’s proud history of Cross Country and XC products, with Volvo Cars having created the niche in 1997. And in anticipation of the full reveal of the car in early 2014, Volvo Cars now shares the first three images of the car as well as a short video on Volvo Cars' YouTube channel.